The holidays are coming—time to stock up. Most of you out there probably only use liquor stores for stocking up your house parties or finding the perfect host gift. You have your go-tos that you simply grab off the shelf without nary a thought before you dash back out the store. Because, if you just allowed yourself to linger and peruse the shelves, it could be a bit overwhelming. Who knew there were THAT many different whiskies? So in this recurring series, I go straight to the source—the spirits buyers from your favorite L.A. liquor stores—for the best deals, hidden gems and what bottle is THE one to have. Mark Schwarz, the spirits buyer at West L.A.’s Wine House, was actually the man who inspired this series. He’s been my go-to when I’m looking for the next big thing, the perfect host gift, and an affordable Pappy stand-in. So knowledgeable in all things hard liquor is he. 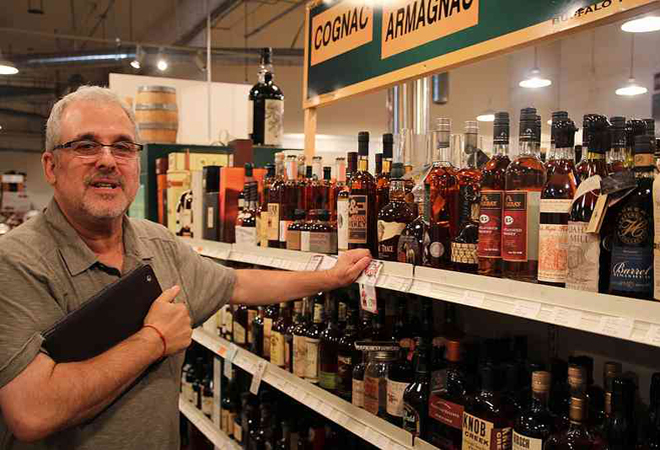 Thanks to him, Wine House’s spirit selection grew from a tiny corner of the store to several aisles and a back wall. But if you’re looking for Cuervo, look elsewhere as Schwarz is super picky about what he allows on his shelves. You’ll find small batch spirits and quality booze, even a locked cabinet for the high-end bottles. Feeling overwhelmed by the unfamiliar brands? Just ask the friendly bearded man roaming the aisles. Bourbon fans should check out his upcoming 6th Annual Bourbon Fest on November 11 where you’ll sample the latest batch of fall releases and get schooled on what’s the best in American whiskey. Averell Damson Plum ($25.99) – I love this stuff all by itself, or on the rocks. Damson plum is like the English sloe (as in sloe gin), sloe being a small fruit relative of the plum. Scott Krahn of American Gin Company uses these dark plums, extracts the juice and mixes it with small-batch gin. It’s tart and sweet, and at 33 percent alcohol, really a liqueur. I’ve recommended it in lieu of cassis for a Kir Royale, mixing it into a plain gin & tonic, or in a sour. Maurin Quina Liqueur ($34.99) was invented by Auguste Maurin in 1906 near Lyon, France. With me, it was one taste. Smooth, elegant, Maurin is made by macerating wild cherries, quinine and bitter almonds in fortified white wine. It’s then blended with cherry brandy, lemon and cherry juice. This stuff rocks on its own, over fresh fruit, ice cream, and in any drink imaginable. I’m not sure why it fell from grace, but Maurin was recently reintroduced. At 32 proof mix it with Rye or Scotch Whiskey, brilliant with Gin or Amaro…it’s a digestif, so use it in place of Campari, Vermouth, etc…I love this stuff. Noah’s Mill Small Batch Whiskey ($55.99) – If a customer asks for a bottle of bourbon around $50 – $60, I hand them this. Year in, year out, it’s the most talked about bottle at our Bourbon Fest, by those unfamiliar with the brand. Big, strong, authoritative, 114 percent, yet brilliantly balanced. A great deal of credit has to be given to Hunter and Brit Chavanne at Willett Distillery. This full-bodied beauty is surprisingly smooth and complex. Toasty warm, the earthiness of leather and coffee, dried fruit, brown sugar, and caramel. The long finish lingers exquisitely, transcendent, not sugary. This is how to make a high-proof bourbon. Sotol Hacienda de Chihuahua ($21.99, $25.99, $31.99) is made of 100 percent wild Agavacea, from the Chihuahuan desert. Bottled at 76 proof, it’s 100 percent pure, organic and delicious. The Plata is smooth and floral, full of the wild agaveca taste, so different from tequila, mescal and bacanora. I tell customers not to use this plata to make margaritas, preferring to offer this bottle as a sipper. The Reposado is aged six months or better. Clean and fresh, with the spice that defines reposado agave spirits. The anejo is aged for a minimum of two years, and I personally finished my first bottle in less than a week. Every evening I wanted another glass, and then another. Henry McKenna 10 Year Old ($26.99) –10 year old bourbon for $27 that drinks-a-whole-hell-of-a-lot-better then you’d expect. The nose is candied nuts and spice, wood mixed with deep, dark fruit. At 100 proof, it balances nicely on the palate. Dark chocolate bitterness, with hints of spice and herbs, and a lengthy finish. A good bang for your buck bourbon on all counts. Brokers Gin ($19.99) – Brokers broke through with me in contrast to Bombay Sapphire Gin. On the palate, Sapphire is light on entry, burns on the finish. Brokers flips this formula and gives you a gin with balance. On entry, you get the heat of the alcohol, but that burn gives way to the juniper, floral, citrus, coriander…all the classic notes that make a good London Dry Gin…finish. Michters Sour Mash ($45.99) – These guys surprised me. I only carried the Michters 10 Year Old Rye for the longest time, not caring much for their bourbons. But this bottle changed my mind. Big and voluptuous, heavy, sweet and bitter, I enjoy a glass of this whiskey very much. E.H. Taylor Sour Mash and Small Batch ($89.99, $39.99) – Both from Buffalo Trace. The Small Batch is complex, rich, smooth, warm, balanced, a wonderful sipper. A.H.Hirsh 16 ($1,339.99) – Having owned one of these before they disappeared then reappeared at $1,500 a bottle…to this day, perhaps the best bottle of bourbon I’ve ever sipped. Woodford Reserve Master’s Collection Seasoned Oak Finish ($84.99) – This was by far the best bottle of this collection thus far. I bought as many cases as we could possibly get before the days of allocation, and sold every last drop. It was beyond compare and thrilled my most ardent bourbon fans. If there’s a bottle out there, I want it. Chartruese VEP Green ($169.99) – While it is certainly among the very best, this may in fact be the best bottle of spirit made. The next big thing in liquor is ______? So many brilliant liqueurs to work with or sip, I think people will want to taste what’s out there. From around the world, liqueurs by Hans Reisetbauer, Stephen McCarthy, Todd Leopold, Jorg Rupf, Trimbach, Tempus Fugit. And less alcohol. As more people ask for drinks that don’t blind, using a liqueur as your base spirit will help that cause. More Liqour Insiders on LAMag.com.